This morning, I have a few graphs on carbon emissions, particularly focussing on China. First off, here are carbon emissions from 1750 to 2008, making clear that the great bulk of the carbon emitted has been since 1950 (ie in the oil era). The data here are from Oak Ridge National Laboratory to 2006, and I have extended them to 2008 by scaling according the growth in natural gas, oil, and coal according to BP. 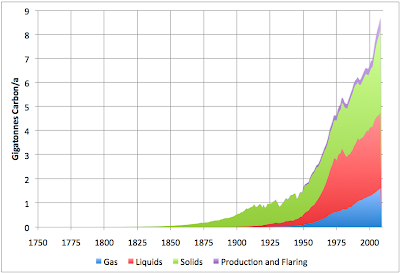 These are just fossil fuel carbon emissions, not including land-use changes, and not including other greenhouse gases. There doesn't seem to be a basis in freely available global energy data for doing this for 2009 yet (no global coal/NG production data - correct me in comments if I'm wrong). Here is a breakdown of carbon emissions 1965-2008 by some key countries. This data is due to BP, who now provide actual per-country carbon emission data, and I just rescaled to a carbon basis. 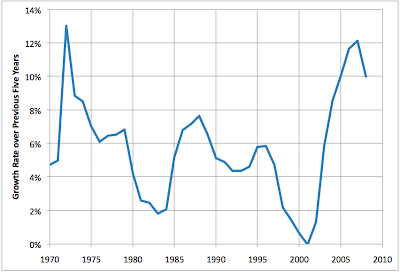 The effects both of the 1979 oil shock and the 1997 Asian currency crisis are evident. In the 1980s and 1990s, emissions generally grew at about a 5% annual rate, but in the 2000s, during the huge private-enterprise-and-exports boom, it's been more like 10%+. Next up, here are data for the countries/groups above individually, with a couple of possible scenarios for the future growth of Chinese emissions. 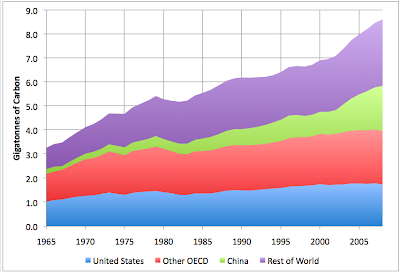 Note the cross-over as China became the world's largest emitter a couple of years back. China has no intention of capping its greenhouse gas emissions even as authorities are committed to realizing the nation's target to reduce carbon intensity through new policies and measures, the country's top climate change negotiators said yesterday. The negotiators also warned that rich and developing countries have little hope of overcoming key disagreements over how to fight global warming. China "could not and should not" set an upper limit on greenhouse gas emissions at the current phase, said Su Wei, the chief negotiator of China for climate change talks in Copenhagen, at a meeting in Beijing on China's climate change policies in the post-Copenhagen era. Su, who is also director of the department of combating climate change under the National Development and Reform Commission, said that China's greenhouse gas emissions have to grow correspondingly as the country still has a long way to go in improving people's livelihoods and eradicating poverty. In the alternative, there are a group of short-sellers who feel China is making excessive poor investments and is due for a crash. I'm not persuaded on that count myself, since it seems that the Chinese government is taking a very Keynesian approach to the recession, and still has lots of cash and credit and many short term stimulus expedients available to it. But in that spirit, I show the orange "China Crash Scenario", which assumes that the country undergoes growth in coming years that is a rescaled version of what happened with the Asian flu. Obviously, the quantitative specifics here are speculative, but the general idea is that China would retrench for a while, but in the medium-term there's still lots of coal and lots of cheap labor, so manufacturing growth would resume. It appears that the world really would like to find out for sure just how sensitive the climate is to carbon emissions. Looking at the issue just as a scientist, this seems fascinating. As a citizen, I'm less pleased. It looks like a lot more coal will go up in smoke. There is good evidence from ice core and other paleoclimate data and also from models that the earth's temperature sensitivity to carbon emissions is in the range of three degrees C for a doubling of atmospheric CO2. If and when the rising temperatures will trigger a breakup of the polar ice caps and initiate much more rapid sea level rise seems to be the critical question. This would hammer some big population centers, including Shanghai. I just read a clear, fairly brief, and up-to-date review of climate science. It's The Long Thaw, by David Archer. James Hansen's new book, Storms of My Grandchildren, goes into the latest science in depth. 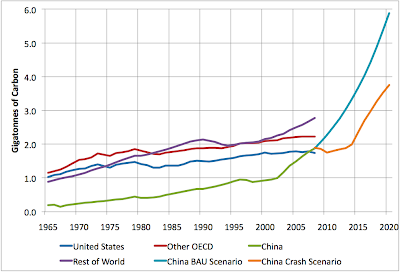 I'm a bit more optimistic about China's BAU scenario. China is, as the quote above states, committed to lowering carbon intensity in manufacturing and power generation and to increasing the proportion of renewable and nuclear power in its regional grids. Their national statistical agency reported that energy consumption per unit GDP dropped 2.2% last year. China recently adopted a national plan to generate 20% of it's electricity from renewables by 2020. One of the advantages China's centralized government has over western governments is that official policies can be implemented with less trouble and delay. In an effort to remove the cost advantage of conventional sources, the government has been discussing a mandatory requirement for generators to buy all the renewable power available. There are now something like 70 manufacturers of wind turbines in China. If the central government decides to go ahead with this, it will just happen. Porsena - I agree there are encouraging signs on renewables. Still, 2% a year change in carbon intensity is much smaller than 10% a year growth. Probably the biggest benefit of Chinese renewables in the short and medium term will be to make it cheaper for everyone else to install renewables. My gut feeling about it all is that the real drive behind expanding wind production was to garner power generation from any source available, and to build up an industry for export. The statement from Wei certainly shows they aren't done with coal generation.